July 24 Update: With today's range of 68°-86°, this month is about to drop out of the top 20 coolest Julys. The monthly average so far of 75.8° is a 5-way tie for 20th place, so another 0.1° increase, likely with warmer temperatures in the next several days, will give it a further tumble in the standings. As temperatures have warmed in the third week of July, Washington's monthly average has climbed well out of the 10 coolest Julys. 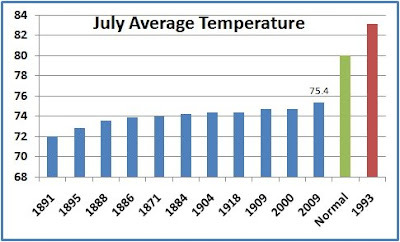 The month-to-date average of 75.4° is now in 17th place, just 0.1° ahead of July 1947. 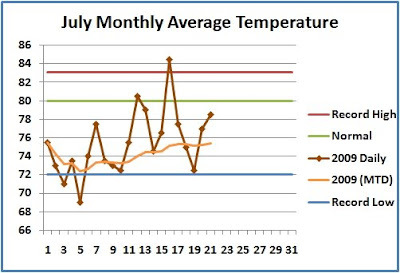 With humidity and cloudiness increasing this week, higher overnight lows should contribute to a higher monthly average, even without excessively hot days.